ON THE GO OC - Things to do with your family. 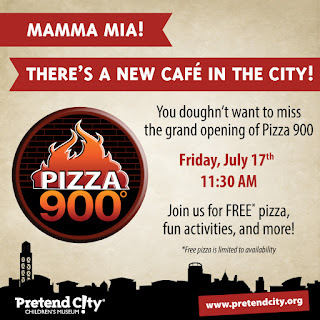 : New Pizza Cafe at Pretend City Opens Today! New Pizza Cafe at Pretend City Opens Today! Mamma Mia!! There's a new Pizza Cafe in town and joining the fun at Pretend City. Join +Pretend City Children's Museum today for a special treat - the grand opening of the Pizza 900 Cafe, where kids can create and serve you pizza with all your favorite toppings. Pizza 900 will be giving out Free Pizza at 11:30, while supplies last. After that you can also check out the yummy goodness over at their location in Lake forest at 23020 Lake Forest Dr in Laguna Hills. Pizza 900 is an authentic Neapolitan wood-fired pizzeria. Owner/Chef Ari Ebnryousef has brought his love for pizza and people together. Pizza 900 Cafe will give children the opportunity to experiment making pizza using some of the 40 different ingredients that the Chef will offer in his Pizzeria! Honey, dates and arugula are just some of the amazing and unique ingredients that will be offered. I am so ready to try this out! My kids love Pretend City and Pizza. My, very picky eater, son just tried pizza for the first time on Wednesday and loved it! I can not wait to play and try Pizza 900!